Discovery is not one to go quietly into the night, as engineers work through the second large issue to be suffered during the veteran orbiter’s final visit to the Vehicle Assembly Building (VAB). Damage to a T-0 umbilical bolt is close to being resolved, thanks to the skills of her engineering teams, which will allow the STS-133 stack to roll out to Pad 39A on Monday. With the Shuttle Interface Test (S0008) completed, engineers have been working on the final VAB tasks, including testing on the Solid Rocket Boosters (SRBs). “OV-103 / SRB BI-144 / RSRM 112 / ET-137 (VAB HB-3): S0008, Shuttle Interface Test, complete at 1315 EDT Thursday,” noted the NASA Test Director (NTD) processing report (L2) on Friday. “SRP PIC resistance and Range Safety tests complete with no anomalies noted. SRB Hydraulic leak checks complete. SRB hydraulic hardness test is complete. Vent doors have been configured for rollout. SRBs powered down at 1256 EDT. Orbiter powered down at 1308 EDT (both Thursday). Associated with the release of the stack from the VAB, engineers also began retracting the numerous platforms that have surrounded the vehicle this week. As noted, Discovery’s team have been working through a new Problem Report (PR) this week, relating to damage on the Left Hand (LH) lower T-0 umbilical bolt. This followed the resolution of the previous issue during mating operations, when an internal nut – prepositioned inside the aft compartment of the orbiter – became loose and moved out of position, negating the possibility of installing a flight structural bolt. 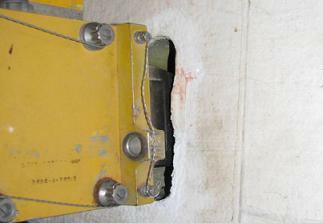 “During T-0 umbilical installation the TSM (Tail Service Mask) carrier plate foot impacted the smaller of the two bolts on the lower LH attach point hard enough to drive a preliminary gauge pin inspection at the location,” the NTD noted in the opening report into the problem. The TSM carrier plate is mated to the orbiter during stacking operations inside the VAB, with engineers moving the large arms – containing a number of umbilicals for cryogenic propellant, gases, and electrical connections – outward of the TSM towards the orbiter to guide them into place on either side of the orbiter. The two bottom feet on each of the plates insert into fittings at the base of the orbiter, with the carrier plate rotating forward to allow it to be locked into place on the orbiter. There is also a large structural bolt, along with a smaller locating bolt for the foot fixture. One is external – just below the OMS pod, and the other is internal – located in a rectangular opening in the orbiter’s skin. 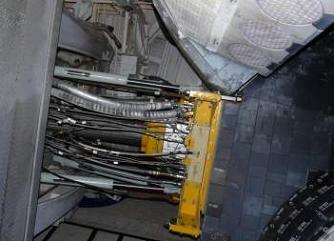 During mating for STS-133, the claw used to engage the internal foot was not positioned correctly, leading to the locating bolt becoming bent. Normally the TSM would have been demated, allowing for the bent locating bolt to be removed and replaced. However, engineers decided drill the bolt out – being careful to ensure the particulates were also carefully removed from potentially contaminating the orbiter. By Friday’s NTD report, the bolt had been successfully removed. “LH lower T-0 umbilical bolt damage: Bolt has been removed. Engineering will pick back up to assess any additional damage/repairs to determine the go forward plan.” All indications point to work being completed by Friday’s end. A minor issue was also resolved during the week, following a problem with the left SRB’s stray voltage tests, caused by a bent pin on one of the system’s connectors. With a spare connector available, the backshell – containing the pins – was completely replaced, clearing the issue via re-testing. Engineers now have the weekend off, ahead of Monday’s rollout, which was pre-empted by Crawler Transporter 1 (CT-1) moving to a location just outside of High Bay 3 (HB-3) where the stack is located. The VAB doors will be opened on Monday for the CT to roll underneath the Mobile Launch Platform (MLP).